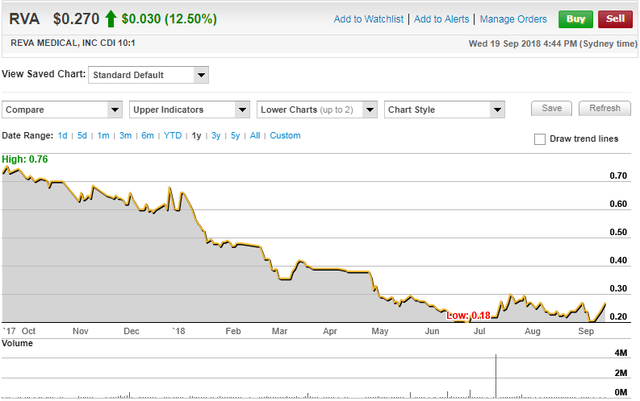 Not only is REVA Medical, Inc. (ASX:RVA) Finfeed’s stock of the week, but it could well be the ASX’s stock of the month depending on what unfolds in the coming days when it presents new data on its proven medical products to a global audience. 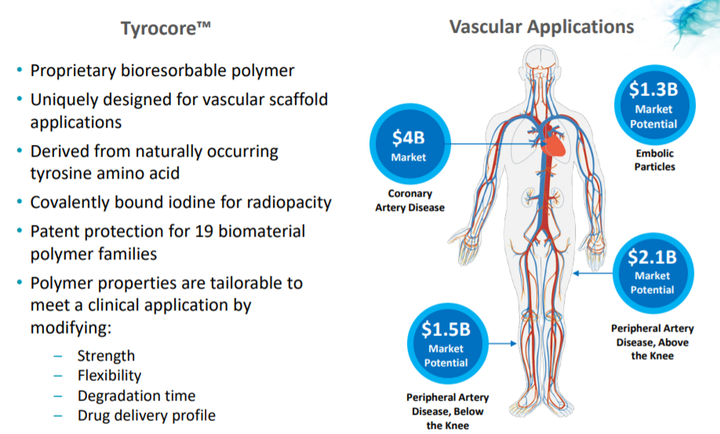 REVA is a medical device company focused on the development and commercialization of bioresorbable polymer technologies for vascular applications. In the last week, the company’s shares have increased more than 30% from 20.5 cents to 27 cents. However, they still appear to be underdone, coming off an arguably oversold base which formed in June possibly on the back of tax loss selling. Any news flow that has occurred in the last three months has been positive, resulting in some brief but substantial rallies. In the latter part of July, REVA’s shares surged 50% under the second-highest volumes recorded by the company during its seven year history as a listed entity. Should findings due to be released in coming days result in the company’s shares gathering momentum, a sustained recovery may be on the cards. However, this remains a speculative stock and investors should seek professional financial advice if considering this stock for your portfolio. REVA is delivering a presentation to industry leaders in its field at the Transcatheter Cardiovascular Therapeutics (TCT) Conference, being held between September 21 and September 25 in San Diego, California. The company’s scheduled presentations will also include two-year results from the FANTOM II trial that were previously presented at the EuroPCR conference held in Paris, France in May. Importantly, REVA will present new data on the Fantom bioresorbable scaffold from its pilot study in patients with a specific type of heart attack called ST-segment elevated myocardial infarction. The broker has an add recommendation on the company with a valuation and price target of 66 cents, implying upside of nearly 150% to yesterday’s closing price. 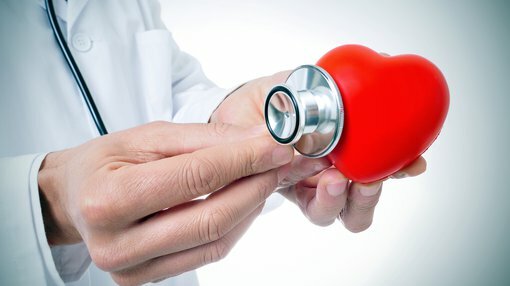 Patients experiencing heart attacks account for between 30% and 40% of the percutaneous coronary intervention (PCI) patient population, and PCI is performed to restore blood flow to the heart. While these patients are at a higher risk than stable patients, the characteristics of their arterial lesions are typically well suited to bioresorbable scaffolds. REVA’s products target the coronary artery disease market (CAD), the most common type of heart disease. Cardiovascular disease is the leading cause of death globally, and CAD treatments aim to restore blood flow through the blocked artery. The company’s lead products are the Fantom and Fantom Encore bioresorbable vascular scaffolds. REVA is currently selling Fantom in Germany, Switzerland, Austria, the Netherlands, Belgium, Luxemburg, Italy, and Turkey. While listed on the ASX, REVA is based in San Diego, California, and employs more than 50 people in the US and Europe. However, more important than where the company is domiciled, is its ability to expand into global markets. The group has a strong track record of introducing its products into new regions as evidenced by the numerous European countries which have adopted its Fantom product. REVA’s entry into new markets appears to have gained significant traction in 2018, and should the imminent news release regarding product progress be favourable this could potentially lead to an acceleration of its global expansion. Fantom and Fantom Encore are sirolimus-eluting bioresorbable scaffolds developed as alternatives to metallic stents for the treatment of coronary artery disease. While the technological description sounds complex, the product and its applications are relatively easy to understand. Scaffolds provide restoration of blood flow, support the artery through the healing process and then disappear or resorb from the body over a period of time. This resorption is intended to allow the return of natural function of the artery with the aim of reducing the risk of adverse events associated with a permanent metallic implant. 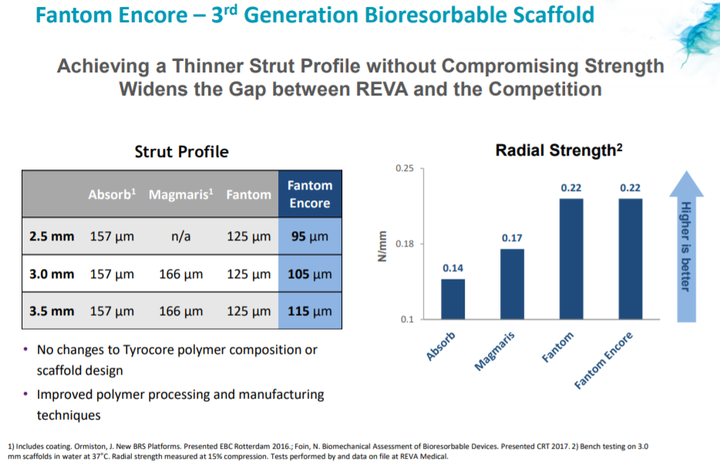 Fantom and Fantom Encore are the only coronary bioresorbable scaffolds made from Tyrocore, REVA’s proprietary tyrosine-derived polymer designed specifically for vascular scaffold applications. Tyrocore is inherently radiopaque, making Fantom and Fantom Encore visible under x-ray fluoroscopy. Fantom and Fantom Encore are designed with thin struts while maintaining strength, as well as possessing distinct ease-of-use features such as x-ray visibility and expansion with one continuous inflation. REVA made substantial inroads in the June quarter, delivering on many milestones that it had outlined earlier in the year which were aimed at driving commercial growth and expanding the use of Fantom. 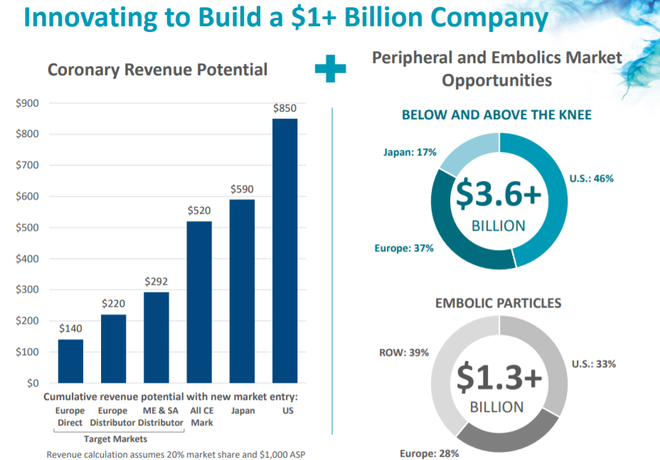 The company entered its first distribution partnership to expand the use of Fantom to Turkey, presented new two-year clinical results from the FANTOM II trial, initiated a post market trial, and secured CE Mark for the full Fantom Encore product line. As a result, REVA is continuing to see growth in product shipments and reorders, which is one of management’s most important metrics of commercial momentum. The company completed on-boarding and training of its direct sales force in Germany, Switzerland, and Austria during the second quarter of 2018. Additionally, REVA began its planned geographic expansion of Fantom by entering into a first commercial distribution partnership with Kardionet in Turkey. In July 2018, REVA announced a second commercial distribution partnership with Bio Vascular Group in Italy and hired a part-time consultant to support direct sales in Belgium, the Netherlands and Luxembourg. During the second quarter of 2018, REVA released two-year data from the FANTOM II trial at the EuroPCR conference in Paris, demonstrating sustained safety and efficacy of Fantom. The results included a low 5.0% rate of major adverse cardiac events (MACE) in 240 patients. MACE is a stringent definition of safety and efficacy combining all events related to cardiac death, myocardial infarction, and target lesion revascularization. 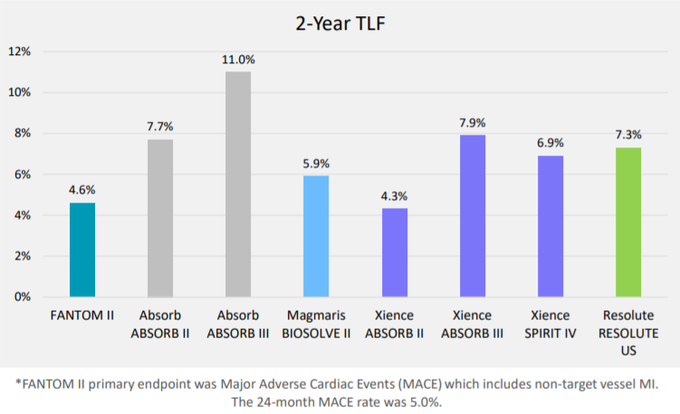 The endpoint of target lesion failure (TLF) is similar to MACE but only includes myocardial infarction events that are related to the treated vessel. 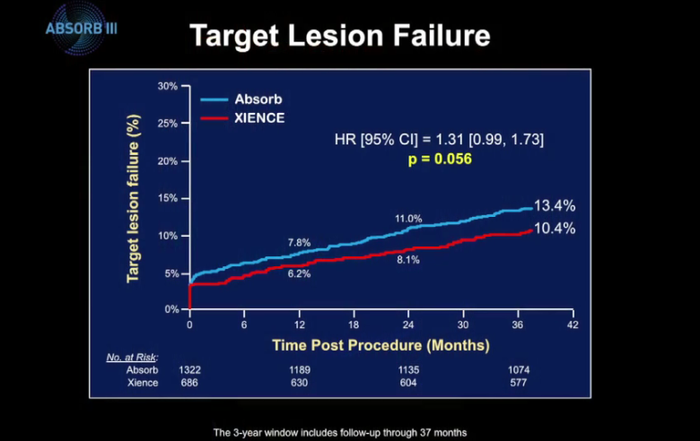 Importantly, the two-year TLF rate from 240 patients in the FANTOM II trial was 4.6%. REVA highlighted that this compared favourably with the two-year TLF rates for to other products, Absorb (11.0%) and Xience (7.9%) in the 2,008-patient ABSORB III trial. During the second quarter of 2018, REVA also initiated the Fantom post market trial in Europe. The first patient was enrolled in May and the company is working to add new hospitals to the study. REVA is targeting an enrolment of 1,500 patients at 50 to 100 hospitals in the post market trial. In June 2018, REVA obtained CE Mark for the full Fantom Encore product line. Fantom Encore, like Fantom, is used for the treatment of coronary artery disease. The approval includes Fantom Encore in the 3.0 and 3.5 millimetre diameters, expanding the approved product line beyond the 2.5 millimetre diameter scaffold which was approved in February 2018. The Fantom Encore product line has thinner struts than Fantom. Reduction in strut thickness is associated with improved outcomes and ease-of-use, which are critical for broader adoption of bioresorbable scaffolds. REVA plans to launch the Fantom Encore product line later this year. REVA recognized $91,000 of net revenue during the three months ended June 30, 2018 compared to zero revenue for the same period in 2017. Net revenue during the three months ended June 30, 2018 grew by 72% as compared to net revenue during the three months ended March 31, 2018, due to an increase in estimated customer usage. Total product shipments for the three months ended June 30, 2018 were $149,000, a 16% increase as compared to total product shipments for the three months ended March 31, 2018. Additionally, the company saw a 38% increase in the total number of customers as of June 30, 2018 versus March 31, 2018. Morgans analyst Derek Jellinek was impressed with the company’s June quarter performance, in particular the 72% increase in revenue.